The Metropolis research team produced a total of 6,154 relocation, construction and refurbishment leads in 2014. Over 26% of these were active UK office space requirements, in line with 2013 and 2012 research results. 1,613 office requirements were confirmed in total, with 1,000 new office requirements uncovered by our research. New office requirements accounted for 22.5m sq ft of UK office demand. 60% of Metropolis leads were projects located in the South of the UK (61% in 2013, 63% in 2012, 61% in 2011, 2010 and 62% in 2009), with 40% of lead projects located in Wales, the Midlands, North, Scotland and Northern Ireland. 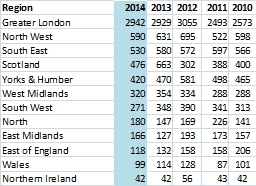 Greater London projects represented 48% of the 2014 lead total, 3% above the 2013 proportion. In Greater London, Metropolis identified just over 18m sq ft of new requirements for offices, with over 800 companies looking for new space. Just over 14m sq ft of this demand was for central London space. The top 5 most sought after postcodes areas by demand were: EC2 (3m sq ft), EC3 (2m sq ft), EC4 (1.6m sq ft), E14 (1.5m sq ft) and W1 (1.4m sq ft). Office relocation and refurbishment activity continues to be strong in the North West of the UK. Metropolis identified 1.2m sq ft of new office demand in the region, 61% of which was demand for Manchester space. The largest requirements emerged from banking and IT companies. In the South East (excluding London), the largest office relocation and refurbishment projects were located in Buckinghamshire and Oxfordshire. Demand for new office space in the South East reached 2.4m sq ft and 39% of this demand was for offices in Berkshire. Leads numbers in Scotland were 28% down on 2013’s record result (120% up on 2012), however the region is still the UK’s 4th most active according to our research. Metropolis identified 800,000 sq ft of new office demand in Scotland as a whole in 2014, 50% of which was centered on Edinburgh. In Yorkshire and Humberside, just under 700,000 sq ft of new office requirements were identified, with 71 companies looking for new space. Demand for new space in Leeds accounted for just over 500,000 sq ft.
West Midlands lead numbers were largely on par with results over the past three years. Just under 0.5m sq ft of new demand was identified in Birmingham. In the South West, just under 700,000 sq ft of new office demand was identified. Bristol was the preferred location for large government, education, energy and insurance company moves. Office take-up in Bristol last year reached 1.2m sq ft.
Lead numbers in the North jumped by 22%, the highest number of relocation, refurbishment, and construction projects recorded in that region since 2011. 23% of office demand in the region centered on Newcastle-upon-Tyne. 55% of Metropolis leads in 2014 reported on projects over 10,000 sq ft. 46% of leads were made up of projects between 5,000 sq ft and 30,000 sq ft. 74% of leads covered projects over 5,000 sq ft. The increase in lead projects between 1 and 2,000 sq ft was influenced by a significant number of central London office, residential and hotel redevelopment schemes unseating existing tenants. The Banking & Finance Sector leapt ahead of Technology & Telecoms in 2014 and was the strongest UK business sector in terms of relocation and refurbishment projects. 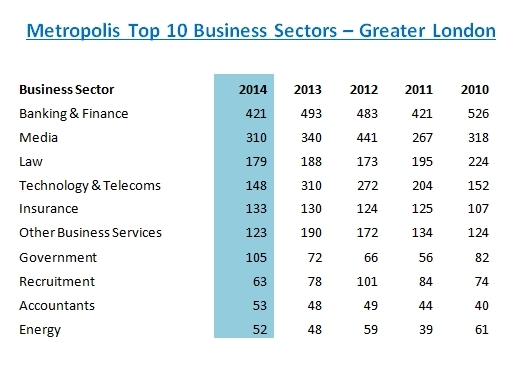 Lead numbers within this sector grew by 7% when compared to 2013, the strongest showing in the last five years. The largest requirements in this sector were unsurprisingly targeted at London space. Four of the top five office requirements were searches by Banks in the City of London. Banks & Financial service companies also had 50,000 sq ft + requirements for office space in Birmingham, Manchester, Southampton and Bristol. Newly identified demand for office space from Technology and Telecoms companies in the UK hit 2.1m sq ft last year. Requirements for space in London accounted for 50% of this figure. The largest searches for offices outside of London targeted Slough, Glasgow, Warrington, Manchester and Oxford. Office demand from media sector companies, often grouped with Technology and Telecoms under the banner “TMT”, reached 1.5m sq ft. London, particularly SW1 and WC2, was the overwhelmingly preferred location for this sector. 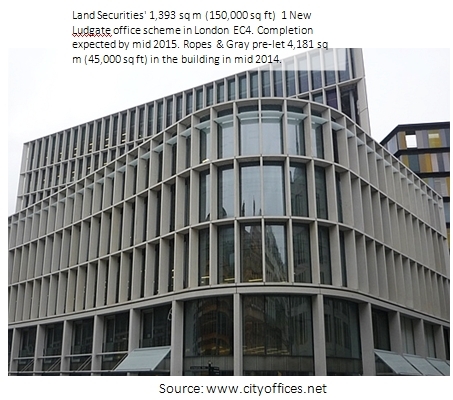 The top ten law firm office relocation projects by size were all located in central London, predominantly the City, particularly London EC4 and EC2. However there were two 70,000 sq ft + requirements for space from this sector in Leeds and a 100,000 sq ft requirement in Manchester. The industry consensus is that London and the south east outpaced the rest of the UK in 2014 as they are further ahead in the cycle, but the predictions are that the regions will begin to pick up in 2015. This is likely to drive an increase in speculative developments and a rise in rents, which will in turn lead to more demand for offices in regional cities. In London, availability will fall again leading to more development and more relocations to fringe central London locations. December was characterised by larger than average number of deals, including large lettings to Google, NeueHaus and WeWork amongst others. The computer and IT sector topped the table of lettings by sector, helped by the Google deal. Business services also saw strong performance in December and a feature of central London take-up in 2014 has been the voracious demand from the serviced office sector for space. By area, the City accounted for half the deals but only 41pc of the floorspace let in the month, while Southbank saw 12 deals totaling 221,000 sq ft including a major deal to ED&F Man. The volume of grade A (newly built or refurbished office space) let during the month grew to 670,000 sq ft as transactions for newly developed or refurbished space took over half the space let in the month. 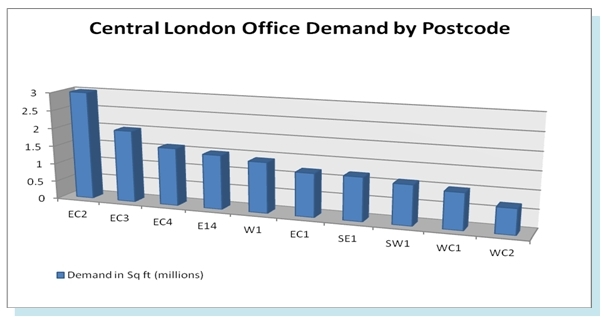 Metropolis is preparing a major report on current office demand in London based on its extensive database. Property consultant CBRE estimates that London office take-up in 2014 has outpaced every yearly total since 2006. It confirms that media and IT sectors took 30% of office demand during the year, just ahead of financial services at 25%. It also confirms Cityoffices research that suggests that Southbank is the fastest growing London office district at the moment in terms of new deals being signed.